Made in Minnesota, for pets everywhere. 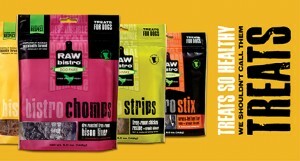 Raw Bistro, believes in the power of the raw diet to help pets live their healthiest and happiest lives. Raw Bistro cares deeply about animal welfare, sustainable farming practices and the health of our shared planet. What’s good for one is good for all. Some people are a bit skittish about feeding their pets raw meats, but it’s no different than buying chicken or hamburger for your family. Humanely raised, high quality meats produced in a clean and well-maintained facility are wholesome and safe. Quality starts at the farm. The meats used come exclusively from grass-fed and free-range animals from local farms. These animals have never been on a feedlot, or been given antibiotics or hormones. Raw Bistro knows their producers, they’re transparent about their processes, and ensure that all ingredients—animal, vegetable and mineral—are USDA source-verified. All of Raw Bistros different foods and treats are processed in small batches in a hyper-clean and well-maintained food production plant. Treats are dried, and raw foods are immediately frozen for maximum nutrition retention. Products remain frozen through distribution to pet food retailers, where they are stored and sold in the freezer case. Available in both 3 lb. mini-patty or 6 lb. reg-patty bags. Available in both 1 lb. bags (makes 4 lbs. re-hydrated). 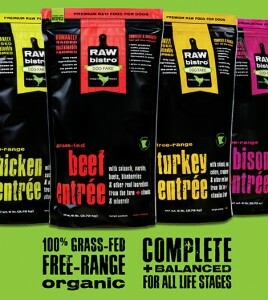 Ask for Raw Bistro at your favorite Solid Gold Northland retailer location. Con: A bit messy so we had to designate an area for the dog. A bit too large for the cat so we would like to try the smaller cuts. Review: Both cat & dog enjoyed these. The cat was hilarious tapping at and touching them with his paws at first! He was very unsure, but he got the hang of it fairly quickly and them it was a challenge to get it back away from him! We are interested in trying the smaller size for the cat as he enjoyed them, but they are a bit large for him. We love that there are no antibiotics, hormones or grains and that the cattle are 100% grass fed. Con: Messy! best used outside or on a blanket in the house! Review: Overall these were great chews for my English bulldog. I loved that they were a health way to utilize all the parts of an animal while providing teeth care and nutrients to my dog. She loved them! Review: The dogs enjoyed these bones on our deck in the sunshine. I like that these bones are natural, without any hormones or antibiotics. It makes me feel good when I am able to give my dogs wholesome, natural food and treats. These bones really help them to maintain their teeth and gums. I would buy these again. Our 4 year old dog, as well as our 8 year old , finick senior had no trouble chewing on these wholesome bones. Con: The raw beef was a little rich for their digestive tract and caused tummy upset and the resulting consequences. I’ll need to work them in small amounts over a long period of time, but for the short haul a little kaopectate helped. Review: Princess and Bella loved the bones and chewed and played with them for hours. What’s really great is that they are cut large enough that my girls were unable to splinter them as they usually do the bones they are given. Review: It makes a great treat for special occasions. 2 Benefits: Kept dogs busy for hours, they loved them! Review: These bones kept our dogs busy for hours. They both really enjoyed them. Review: My dogs really loved them, kept them occupied. Review: One of my dogs is a MAJOR chewer…bully sticks are gone in a heartbeat. Flip flops and dress shoes are not sacred in the house. Nothing is safe from our dog! The raw knuckle bones, frozen, are a great safe thing for him to chew, and I can only imagine that it aids in cleaning any tartar build up on his teeth. So impressed with the product that I will keep a package in my freezer from now on. Review: My senior Papillon is not big on chewing and the knuckle is pretty large for him, but he took to this one right away. He used it for two days and then was done with it. He got what he could off of it (a little meat and tendon) and didn’t chew the bone itself. I think a marrow bone would be better for him rather than the knuckle. I really like that the cattle are grass fed and pasture raised. It makes for a superior product and, more importantly, a more humane one. Con: My dog got loose stools. I had to let her out during the night. Maybe smaller bones would have worked better. 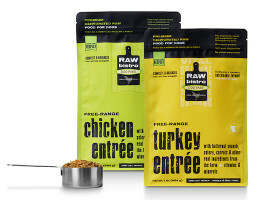 Review: I would recommend this product- bones from free range animals that my dog loves. 2 Benefits: Dogs LOVED these & they last forever! Con: Greasy at first….but after a day or so of chewing we allow the dogs to eat them outside their kennel. Review: The dogs go crazy happy for these…in fact, there hasn’t been a single product from RAW bistro they haven’t enjoyed! We love that the bones are from grass-fed, pasture raised cattle that have no added hormones or grains! Review: I gave my Bella one and I swear she didn’t let it out of her sight for over a day. She carried it around with her everywhere, she even tried to take it outside but I wouldn’t let her. She growled at the cats if they came within three feet of her. All I can say is she loved it. I don’t think that the cats are really all that interested in it other than the fact that Bell has it. I would certainly buy these bones, there is plenty of tissue left on them and they are in a re-sealable package. 2 Benefits: My dogs not only loved the smell they seem to like the taste . Review: I think I got these as part of the review at Solid Gold Northland and then I received some at the Year in Blast for Disc Dog of MN. My dogs went through both very quickly the smell of these treat but them in work mode and they would go through every treat they knew to score one. The other nice thing about them was the dryness of the treat. It was easy to carry around. Excellent treat for serious training sessions.